February 17, 2013 January 6, 2015 by Tara R.
Whenever I visited Hilde, my adopted Cuban abuela, she would drink espresso from china demitasse cups she brought with her when her family fled Havana. The afternoon I helped her scrape black beans off the ceiling when her pressure cooker exploded, she made me cafe con leche, and a love for sweet coffee was awakened in me. Using an espresso machine, follow the instructions for brewing, using about 5 tablespoons of Cuban, Dark Roast Espresso Ground, packed, for each cup of water. Add 4-6 teaspoons sugar (per cup of water) to the pot the coffee drips into, stirring the first few drips to make a frothy foam. You want the drink very sweet. Combine one shot of sweet coffee to a small cup of hot, steamed milk. Prompt #12: In 57 words or less, tell us about the best drink you ever had. Now THAT is a coffee drink I could embrace! Here in Florida, Cuban Coffee is huge. 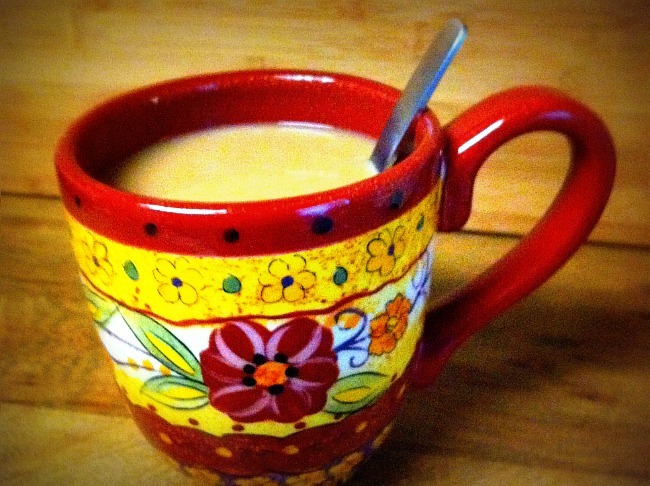 I am not a regular coffee drinker at all, but a good cafe con leche, yum! And your story makes it so much more beautiful. My husband would love this one. Beautiful response, Tara. Thanks for linking up! Sounds delish! I love a good coffee drink. What a fond memory. The coffee cup is beautiful, as is the memory. How sweet. I LOVE coffee. This is a terrific drink recipe. Thanks for sharing with us! I try, but I still haven’t been able to make it like Hilde did. It was nectar of the gods!